It’s not easy finding time to exercise these days. With busy family and work schedules, sometimes it just seems like there’s no time to hit the gym. But with under desk treadmills, you can literally exercise while you work. Instead of just sitting there, ruining your posture, you can burn calories and improve your cardiovascular health- all from your desk. But in order to find the best under desk treadmills, you have to know what to look for. Don’t worry, you came to the right place. This review will walk you through the key specs and features to consider when comparing these ingenious machines. Then I’ll provide my top picks based on the specs we discussed. By the time you finish this article, you’ll know exactly what to look for and where to find it. Let’s get started. What Is An Under Desk Treadmill? I think it’s a good idea to make sure we’re all on the same page here. The name pretty much says it all- an under desk treadmill is a small treadmill that fits under your desk, allowing you to walk (instead of sit) while you work at your desk. Pretty simple, but there’s a little more to it than that. There are 2 basic types of under desk treadmill: those that don’t include a table workstation and those that do include a table workstation (treadmill desk system or integrated treadmill desk). For the purpose of this review, I’m only talking about the ones that don’t include a workstation. This means you have to supply your own standing desk. These are usually preferred because you get to pick your own standing desk separately (which usually means you get a larger, more functional work space). And yes, you guessed it, a “standing desk” is a higher desk designed to be used standing up instead of sitting. Under desk treadmills are sometimes referred to as “treadmill bases”, because they can look just like a traditional treadmill, minus the handrails and console. A lot of the under desk treadmills (especially the early ones) were basically just normal treadmills that had their rails and consoles removed. This sounds like it might make sense, but think about how tall, heavy, and noisy a lot of normal treadmills are- would you want to have one of these running in your office while you work? Luckily, the nicer ones these days are specifically designed as desk treadmills. This means less noise, smaller profiles, and lighter weight machines that are easier to move around. I know a lot of corporate offices are starting to use standing desks. Just like the whole stability ball chair thing, it’s all about finding ways to keep employees healthier at work. It’s a well known fact that sitting all day is bad for your health for many reasons. If you already have a standing desk at work, it might not take too much persuading to get a treadmill under it. If you’re your own boss or you work from home, then it’s your call. 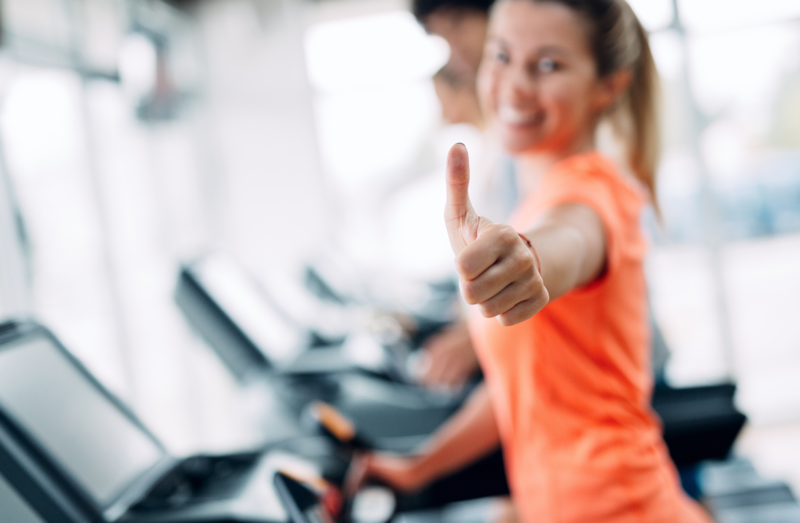 It’s important to have a set of criteria to use to compare treadmills against each other. This is the only way to ensure we are comparing apples to apples and oranges to oranges. When we use the same criteria for each machine, it’s easier to see which machines stand out from the pack. I suggest you use the following criteria when comparing under desk treadmills. These specs are actually really similar to the ones you should use when comparing home treadmills too. The motor is a good place to start. The motor strength is measured in horsepower (HP) with higher numbers indicating a stronger motor. Since under desk treadmills are designed for walking (it’s impossible to run and work at a desk… or is it? ), they usually don’t pack quite as much horsepower as the home treadmills designed for running. Although it turns out walking at a slow speed (1-2 mph) actually requires more torque from the motor than running on it does. And a lot of strong motors aren’t designed to produce these higher torques at slow speeds. Even so, it’s usually preferable to go with a stronger motor. These treadmills come with motors in the 1-3 HP range- when possible it’s a good idea to go with one closer to 3.0 HP. For more information, check out this great article on treadmill powertrains. This is a big one in terms of comfort. Having a larger belt size means you have more room to walk. Would you like to have to walk in a straight line or would you rather have a little wiggle room? Most of us would opt for the wiggle room. Since under desk treadmills are designed for walking, you don’t need quite as much length as you do on a running treadmill. But width is still just as important. Belt size is measured in inches. Most of these treadmills have widths in the 18-20″ range, with 20″ being preferred. Most of these treadmills have lengths in the 40-50″ range, with closer to 50″ being preferred for comfortable walking (being able to walk naturally without having to shorten your stride). The actual dimensions of the treadmill is important to consider because you have to know how much room you need in your office space. An important aspect here that isn’t as important on standard treadmills is the height of the base. This is important because you need to know this value in order to make sure your standing desk fits appropriately. This something you should consider anytime you buy any type of fitness equipment you have to sit or stand on. You have to know that you can safely use this product, first and foremost. Also, the max weight capacity gives us a nice objective way of determine how robust and sturdy these treadmills are. Treadmills with higher weight capacities have to more durably built. I only weigh about 200 lb (“only”, ha! ), but I look for at least a 300 lb weight limit on any equipment I purchase. Last, but not least, is the warranty. You always, always, always want to check the warranty before making a purchase. This is your insurance plan in case something goes wrong. Better treadmills tend to have better warranties. More expensive treadmills tend to have better warranties. Cheaper products tend to be constructed out of materials of lower quality (hence their lower price), and their brands know this- so they expect their products to fail sooner than later. Quality treadmills come with lifetime frame warranties. Motor warranties vary, but 3 years is pretty good. Shoot for at least 2 years on parts. Labor warranties are rarely greater than a year. The iMovR ThermoTread GT is considered the most sophisticated under desk treadmill on the market to date. This treadmill was designed specifically for use in an office, which is pretty obvious when you start diving into the specs. The ThermoTread GT comes with a 3.0 HP motor with a max speed of 2.5 mph. This motor is not only on the stronger side of the norm for under desk machines, but it’s also designed to provide max torque at these lower speeds- something that is essential for motor longevity (recall how much stress the motor is on performing at such low speeds for prolonged periods). To go with the strong motor, this treadmill comes with a spacious belt size of 20″ x 50″. Combine this with the 6 built-in compression shocks and you have the recipe for a really comfortable walking machine. Don’t let the sleek design fool ya either, the ThermoTread is built strong. With a max weight capacity of 400 lb, this treadmill is robust enough to handle even the largest of walkers. It’s also been rated as one of the quietest under desk treadmills around too, which is crucial if you plan on being productive on this machine. Rounding out the impressive spec sheet is an equally impressive warranty: lifetime frame, 3 year motor, 2 year parts, and 1 year labor. While the above stats are enough to land the ThermoTread on this list, the jewel of this treadmill is actually its console. This treadmill comes with a state-of-the-art touchscreen console that is more capable than any other comp on the market. Not only does the touchscreen make it easy to make your selections and track your stats, but it also comes with 5 different user profiles and a liability waiver (handy for corporate use, makes sure nobody gets sued if someone hurts themself on this machine). iMovR is in the process of developing their CloudStation, which will enable you to connect the ThermoTread to the internet for all kinds of data tracking. Should be some pretty cool stuff. Overall, the iMovR ThermoTread GT has all the specs to claim the title as finest under desk treadmill. Add the high-tech console and there’s little room for debate. The TR5000-DT3 by LifeSpan looks a lot like the ThermoTread… until you get to the console. Although this treadmill doesn’t have the same hi-tech console as the treadmill above, it’s still rocking some really impressive specs that most users should appreciate. This treadmill is also sporting a 3.0 HP DC motor. The biggest difference on the TR5000 is that it can reach a max speed of 4.0 mph- almost 2x that of the ThermoTread GT. Now it would be nearly impossible to do any kind of work while walking at 4 mph, but this might come in handy if you wanted to take a break from work and do a faster pace walk for a more strenuous workout. It gives you the option to set your max speed to 2.0 mph as well, for safety reasons. The TR5000 also comes with a 20″ x 50″ belt. Speaking of the belt, this treadmill comes with an extra thick, maintenance free belt. Meaning you don’t have to lubricate it regularly (eventually you will probably have to start lubricating, but that could take years). This treadmill has a pretty compact design with a step-up height of less than 5″. This is good because it shouldn’t be difficult for your standing desk to accommodate the extra height of this machine. The TR5000 also comes with a 400 lb weight capacity and a great warranty: lifetime frame, 3 year motor, 2 year parts, and 1 year labor (identical to the ThermoTread). The biggest difference between this treadmill and the previous one is the console. The TR5000 has a console that looks like it came straight out of the ’80’s. I will say it’s a little more advanced than it looks- it can track all the expected stats and it will even turn off automatically if you stop walking. It’s also bluetooth capable and can connect with LifeSpan’s free app to store all your data. There’s about a $200 difference between this and the ThermoTread. If you don’t care as much about the advanced console, you can save yourself a little dough and go with the TR5000- it’s very comparable to the ThermoTread in every other category. Yup, another LifeSpan treadmill made the list. The TR1200-DT3 is LifeSpan’s most popular under desk treadmill. Designed for a single user (as opposed to the top 2 treadmills that can easily handle multiple users), the TR1200 lacks several upgrades that make the TR5000 so impressive. Even so, this treadmill has some impressive specs that deserve attention. And with a price tag nearly $400 lower than the TR5000 (and $600 lower than the ThermoTread), the TR1200 may just be the best buy of the bunch. This treadmill comes with a 2.25 HP motor. This is significantly weaker than the 2 previous motors we’ve discussed, but it can still reach a max speed of 4.0 mph. And just like the TR5000, you can change the max speed to 2.0 mph if you prefer, for the sake of safety. The TR1200 comes with the same spacious belt as the more expensive models. With a walking surface of 20″ x 50″, even taller users should be able to walk comfortably on this machine. And with a max weight capacity of 350 lb, this treadmill can handle the majority of folks out there. You’ll notice that the weight limit on this machine is a little lower than the 400 lb limits of both the previous treadmills. This plays into the fact that this treadmill isn’t quite as robust. But with a single user in mind, it should hold up well. And in case it doesn’t, it comes with the same great warranty as the TR5000- lifetime frame, 3 year motor, 2 year parts, and 1 year labor. This treadmill comes with the same cosmetically challenged console as the TR5000. Functional, but no where near as technically sophisticated as the ThermoTread. Overall, the LifeSpan TR1200 is a great under desk treadmill for single users or small teams that won’t have it running all day. With decent specs and a great warranty, there’s good reason why this has become one of the most popular under desk treadmills around (not to mention the more affordable price). No, your eyes aren’t deceiving you, there is ANOTHER LifeSpan treadmill on the list. What can I say, I’m a sucker for a lifetime warranty. The TR800 is a watered down version of the other 2 LifeSpan treadmills- weaker and smaller everything. But for the price, it’s still got enough going for it to beat out most of the competition out there. The TR800 comes with a 2.0 HP motor. So, a little weaker than the TR1200 and significantly weaker than the TR5000. This treadmill still has a max speed of 4.0 mph and the option to set that top speed at 2.0 mph if you want to. One of the biggest differences you’ll notice on this cheaper model is its size- the TR800 is a lot smaller. It’s belt size is only 18″ x 45″. This is going to be a tight fit for taller folks. If you’re over 6′ tall, you might want to consider one of the other, more spacious treadmills. Going along with the smaller motor and smaller belt, this treadmill also has a smaller max weight capacity. Although at 300 lb, the TR800 can still accommodate most users safely. I still wouldn’t recommend this treadmill to taller people though, I think the smaller walking surface would be uncomfortable. Because of the smaller size and weaker motor, LifeSpan recommends the TR800 for “light use”, meaning no more than 3 hours of walking a day. I don’t think I mentioned it above, but both the TR1200 and TR5000 are suitable for “all day use”. One advantage this treadmill has over its larger, stronger siblings is its compact size. With a foot print of roughly 5′ x 2′, this treadmill can fit in pretty tight spaces. It also only has a step-up height of 3.75″, so it should be easy to fit it under any standing desk. I want to mention that even though this is LifeSpan’s cheapest under desk treadmill, they still back it with a lifetime frame warranty, as well as 3 years on the motor, 1 year on parts, and 1 year on labor. At well under $1000, the TR800 is a pretty impressive, compact treadmill. It would be best suited for smaller users looking to walk for a couple hours a day. Finishing out the list is the Rebel Treadmill 1000. It doesn’t have the muscle or durability to compete with the LifeSpan models, but it does come with a solid warranty- one’s that’s significantly better than a lot of the budget desk treadmills. The Rebel 1000 has a 1.5 HP motor, making it the weakest on this list by far. It has a max speed of 2.0 mph, which is appropriate for “work walking”, where the key is to walk slowly enough to maintain it for longer periods, but to also ensure you are able to actually work as you walk (work becomes impossible if you’re bobbing up and down too much). With a belt size of roughly 50″ x 18″, it’s a little narrow, but plenty long for a comfortable walking stride. The compact footprint ensures this treadmill can fit in pretty small work spaces. It’s also very lightweight (total weight of 88 lb), making it easy to move around with the built-in transport wheels. The Rebel 1000 has a max weight limit of only 250 lb. Given the weak motor, this isn’t a surprise. It’s a good idea to have a little cushion too- if you weight 248 lb , this probably isn’t the treadmill for ya. The feature that sets this apart from the other budget friendly desk treadmills is the warranty. Rebel backs this little guy up with a 20 year frame warranty, 2 year motor warranty, and a 1 year parts warranty. They also offer a 100% money back guarantee for 30 days after purchase, which is a nice touch. Overall, this is a small, affordable desk treadmill with a weak motor. It’s most redeeming qualities are it’s small size and solid warranty. This is the most affordable machine on the list, so if your budget is tight, you gotta do what you gotta do. But you may be better off and saving up the extra $100 and going with the TR800 (there have been some complaints about this treadmill being a little too “lightweight”). Under desk treadmills can be a great way to get more exercise and stay active at work. They’ve also been shown to help improve productivity. With a lot of offices going to standing desks already, the transition to desk treadmills can be pretty painless. Keeping a close eye on the above stats should help you find the best product for your budget. These are the specs I used when developing this list. Long-story-short: the best under desk treadmill on the market right now is the iMovR ThermoTread GT. You can’t go wrong with any of the LifeSpan desk treadmills either. If your budget is really tight, you can try the Rebel 1000. I hope this guide was helpful. If you have any questions or comments, leave them below and I’ll get right back to ya.